« Will Facebook replace your B2B Marketing email system? A recent Cone Inc.’s Social Media in Business study found that 60 percent of consumers believe they are already interacting with companies on the social Web. Nearly all participants — 93 percent — believe all companies should have a presence in social media. And 85 percent believe companies should not just present information via social media, but use it to interact and become more engaged with them. And the payoff for such engagement is evident in the 53 percent who already say they have developed a stronger connection to a brand through social media encounters. But the question has long been 2 fold: 1) How do you create engagement and 2) How do you measure it. Hopefully this will give you some insights into how my team creates and measures engagement at Avaya. Over the last few years of writing this blog I have talked a lot about the virtues of creating a steady stream of content that is consistent in its frequency to bring people back to your site time and time again. You can call it Inbound Marketing (like the folks at HubSpot do) or you could call it Content Marketing (like the folks at Junta42 do) but whatever you call it this is the basis for all your online activity. Over the last month or so we really have gotten our content engine humming producing not only some great thought leadership, eBooks, blog posts etc which we use as social “objects” but also we held (what I believe is) one of the largest Virtual events ever with On24. Their platform is good up to 20,000 people and we had 24,000 signed up for our January 19, 2010 virtual event. Sure we were worried what would happen if everyone showed up – but luckily that wasn’t the case but we did test the upper limits of their system! With all this create content both in object form and recorded form from the virtual event we were really able to ramp up the number of conversations we were having out on the socialsphere as you can see from the snapshot taken from our Networked Insights dashboard which is comparing the month of December to the month of January. Years ago on this blog I remember saying “measuring engagement is hard since there is no one button you can push as a marketer to measure it”. 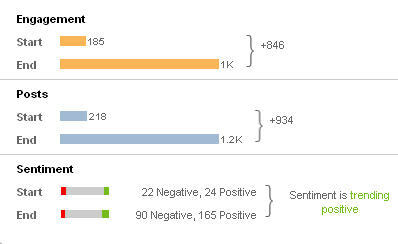 Well I have since learned otherwise from the folks at Networked Insights who not only measure the number of posts in one period versus the number posts in another period but they also measure the tone and sentiment of those posts giving you an indication that (in our case) sentiment is trending in a positive direction! As you may know already, blogging is a quantity game. 5 of the top 10 media properties are blogs and all of them are multi author blogs which post several times per day. Social also acts in the same way – the more your engage the more people engage back. So one of my team’s objectives this year is not only to create more social content but also to move the needle on engagement and sentiment. Stay tuned to this blog for more updates and to see how we are doing that! That’s an impressive number for a virtual event! Of the companies and brands that I interact with on social media, I purchase products from nearly all of them. Not just because they are on “the top of my mind” when I’m ready to purchase, but because I feel like I know them. Some how, I trust a company like Best Buy more after I’ve engaged with them on their Facebook page. It’s probably not rational, but in the end, it doesn’t really matter. They have me as a customer. Congratulations Paul! It’s great to see the successful trends – this is definitely the year when the metrics start living up to the promise of all these techniques (social media outreach, content engines, lead nurturing/management…). Just this week I’ve seen one piece of content originally created just for a direct campaign to 2,000 contacts reach its thousandth ‘engagement’ from inbound sources with no signs of slowing down or attracting contacts who are any less relevant (small numbers perhaps, but we’re in the UK after all!). Interesting statistics. It’s great to have stats and figures to prove your point about consistency of interaction.